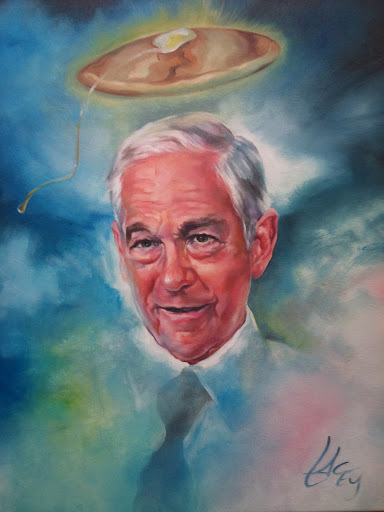 A painting of Ron Paul with a golden pancake over his head. 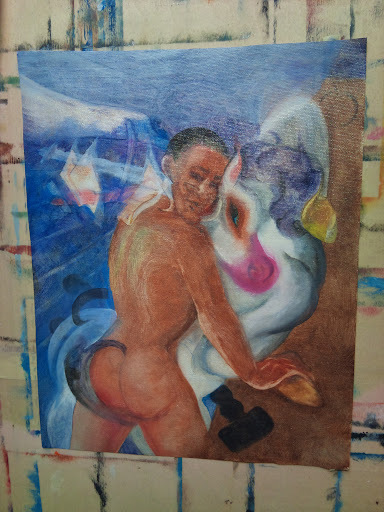 Revision of an earlier painting. The Ecstasy of Dan Lacey from Tom Grotewohl on Vimeo. A second portrait of Jared Loughner with a bullet covered pancake on top of his head. By commission. 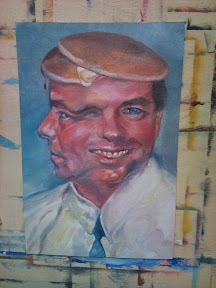 John Edwards two-faced mug shot portrait painting. This painting is inspired by the recently released mug shot of former US Senator John Edwards, who was indicted on federal charges for using close to $1 million in illegal campaign donations to cover up an extramarital affair he had while running for president in 2008. The original police mug shot shows both profile and frontal pics of Mr. Edwards, who beams broadly in the latter. Mr. Edwards is charged with conspiracy, taking illegal campaign contributions, and making false statements. The 'two faces' of Mr. Edwards' mug shot are included in the portrait. 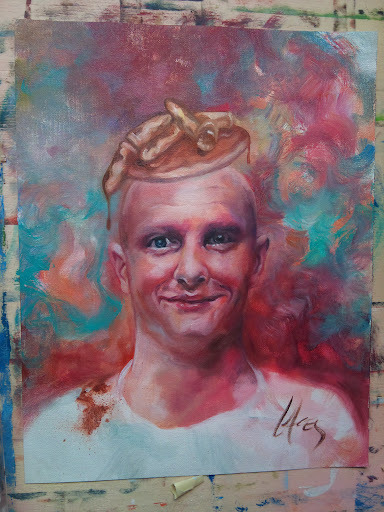 The two pancakes upon his head represent both his wife and his mistress. Even in decompositon his wifes' pancake has a predominant presence over the subject; it sports in the center a frayed pink ribbon which represents her losing battle with breast and other cancers. Visually it also doubles for the shape of Mr. Edwards' hair. Below his wifes' pancake is the pancake of his mistress, and here Mr. Edwards is looking away from the viewer unwilling to confront. The butter pat between the pancakes is the child he attempted to hide. 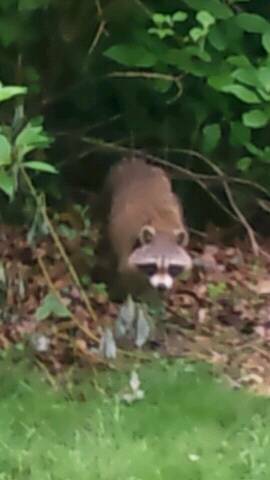 Mr. Edwards' has an ill-formed center eye; this is the personal void between deceit and denial. 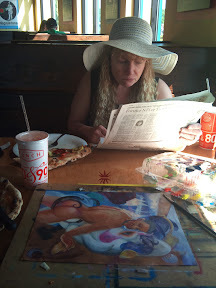 Thanks to President Suit , Kevin Bradshaw at I Blog Every Day, and Juan's Art Blog for the nice posts. 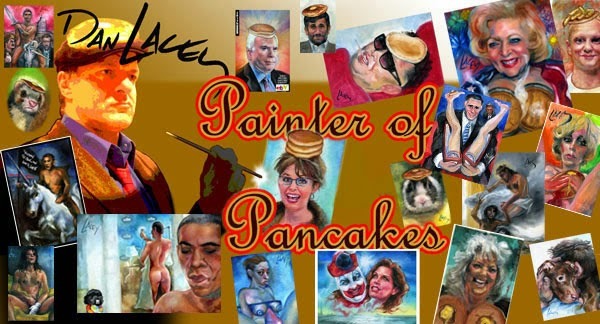 A new portrait of Osama Bin Laden with pancakes on his beard. By commission. In a frenetic frenzy we finished the filming for the documentary in two days. But please, skype me anyway. Thanks to everyone who participated. My apologies to those who's calls we missed. Three paintings which I have up for auction on Ebay, ending Monday June 13. Please consider skyeing me at 'thepainterofpancakes' on Saturday 11-5 pm US Central time, Sunday 11-5, or all day on Monday to possibly appear in a documentary regarding my paintings. 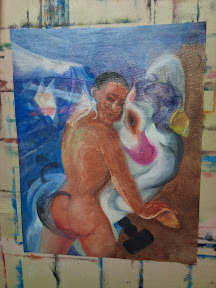 Bidding on paintings not necessary, but please stop by especially if you own one of my previous paintings. A Ron Paul portrait, in progress. Acrylic underpainting.